Leaving behind a frothy white wake, our ferry, the Lord of the Isles, churned through the dark, blue-green Atlantic. The May morning was as clear and crisp as the night before had been bleak. “It’s red condition all up and down the coast,” the rubicund young woman behind the counter at the terminal in Oban had told us. “All sailings are cancelled.” Now running a day late, my wife and I were finally bound for Colonsay, a tiny, remote island in Scotland’s Inner Hebrides. Eight miles long and three miles wide, Colonsay, population 100, is a patchwork of rolling prairies, lonely beaches, sheltered groves, swampy moors, and craggy peaks. Ruins of abandoned villages and monolithic standing stones, many of which date to the Bronze Age, jut from hilltops overlooking the sea. The landscape is rugged, severe, arresting. 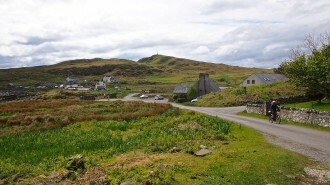 But more than for the beauty of it, I was set on visiting Colonsay for its ties to my family name. During a visit to Edinburgh twelve years before, I had happened into a specialty heritage shop to check out the kilts and other tartan-crafted wares on display. “If you’re from the Macfies,” the proprietor said, “then you must go to Colonsay.” I found the island on an atlas. I did some digging. I learned that Colonsay had been the locus of great victory and crushing defeat for the Macfie clan, which had ruled the isle in mediaeval times, lost control of it in the 1600s, and left it for good in the 18th and 19th centuries. Some of the Macfies had decamped to the New World, tweaked their last name ever so slightly, and settled on the vast, rolling plains of my native Texas. More than a decade since that souvenir shop encounter — and two-and-a-half hours since leaving Oban — we stepped from the ship onto the pier at Scalasaig, the closest thing Colonsay has to a town. At the end of the pier, a freckle-faced young woman with tousled hair and a nose ring offered us a ride in a tiny white hatchback. I declined. I was confident we could make it on foot to our lodgings before nightfall. But the road was steep and our packs were heavy. Not yet a mile into our walk, when a dusty, blue Mitsubishi SUV pulled off to the side of the narrow asphalt road and motioned us inside, we complied. The man’s name was David. He was wearing coveralls. His wiry gray hair peaked out from beneath a wool stocking cap. David said he grazed cattle and sheep at the far northern and southern ends of the island. Esk, his oreo-colored sheepdog, rode in the hutch. The road snaked around rocky peaks and passed between rolling fields separated by barbed wire fences. We had no sooner struck up a conversation with our chauffeur than he was dropping us at the entrance to the Georgian estate known as Colonsay House. We said goodbye and tiptoed over the cattle guard. The sun sidled the horizon. The wide, slate shingled, two-story estate was eerily quiet. We dropped our bags in our second-floor room and headed out to explore the grounds before dark. The Colonsay House was built in 1722 on the site of an ancient abbey. It is surrounded by lush green meadows and fields of wildflowers. We crossed the marsh in front of the house and hurried up the narrow road towards the whooshing sound of unseen waves. On the other side of a sand dune, the crescent-shaped shore at Kiloran Bay, Colonsay’s largest sandy beach, unfolded before us. A strong, sustained rush of salty, swirling sea air met us head on as we faced the incoming surf. I closed my eyes. Had my family, all those great-great-great-greats, once walked along this strand of golden sand, peered out to the horizon, and watched the sun sink into the same black ocean? As the water lapped and foamed, I turned and observed the dunes and hills overlooking the bay, their ridges and valleys illuminated in the evening’s last, deceivingly warm light. Gusts of wind chapping our faces, we turned back toward the estate. Sunlight through the antique windows awoke us the next morning. In late spring, in northwest Scotland, the sun stays up for nearly seventeen hours a day. Our stomachs growling, we began the long, tranquil walk back to Scalasaig for breakfast at the café, a laid-back, local staple with a few tables and an open kitchen that serves coffee and scones with jam in the morning and tea and fish and chips for lunch. A red Royal Mail pickup truck was parked out front of the post office across the street. Inside, while I picked out postcards to send home to the States, the mailman ventured a brief history of the postal fleet, the photos of which hung on the wall in a makeshift memorial. “The Land Rover lasted ten years,” he said, pointing, “and the pickup has lasted three. The other two wee cars didn’t last very long.” Colonsay’s salty air, he explained, eats away at the metal, eventually rendering vehicles inoperable. Our business in town finished, on and on we walked, west then south along the single-lane road from Scalasaig. A half hour into our hike, we came across a bronze roadside plaque pointing to the ruins of Dun Eibhinn, a pivotal station in Macfie lore. The ancient rock fort sits atop one of many rocky peaks overlooking the small lake, Loch Cholla, and the remnants of the ancient village of Balaruminmore. Affording a commanding view of the entire island, the fort, widely believed to have been built by early Celtic tribes, later became the seat of power for the island’s Viking rulers. Control of the fort and island eventually settled into the hands of the Macfies, the island’s mediaeval power brokers. For hundreds of years, competing clans jockeyed for power and fought for control of Scotland’s western highlands and Hebridean islands. Pacts were made, allegiances broken, retribution meted out. In 1623, Malcolm, the last chief of the Macfies, was tied to a nearby standing stone and shot by a member of a rival clan. 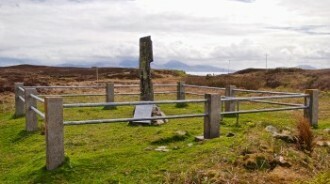 Macfie Rock (Carraig Mhic a’ Phi), as the spot has come to be called, became a place of pilgrimage for the clan’s descendants. In search of the stone, we veered left off the asphalt road and began a long, gradual hike up a dusty dirt track. A highland bull with a coat like a shag rug munched tall weeds in a meadow overlooking the loch. Abandoning the path, we trudged through prickly brush, crossed a gully, and made our way across swampy peat to the Macfie Rock. There, paused in front of the jagged stone, gazing out through a gap in the grassy hills to the misty sea beyond, I closed my eyes and tried to picture my ancestors. Did they come to this stone, fastened now with strips of rusty iron to keep it from falling apart, before leaving their island homeland, the whipping wind cooling their tear-soaked cheeks? Did they glance over their shoulders one last time at this rough monolith before boarding ships bound for unknown, distant shores? The chilly wind squalling past my ears, I listened closely, trying to imagine the feint echo of their voices but, of course, I heard only the wind, only the wind and the sea that never ceases from beating upon the stony shore. In the end, perhaps it’s the outside elements that unite us. Perhaps what flows from without trumps what flows from within. Jarred McAfee is a writer currently living in London. 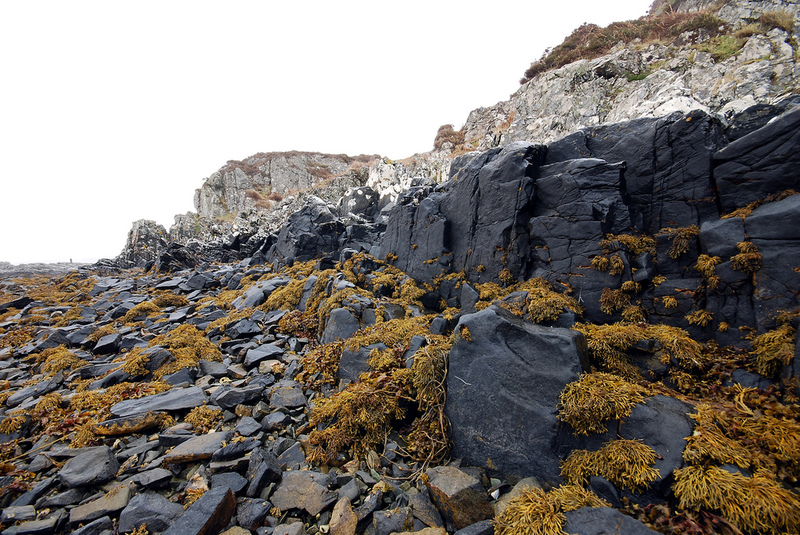 To see more of his photographs from Colonsay, click here.